Background: Single incision laparoscopic surgery (SILS) has been indicated for benign diseases of the gallbladder for recent several years. However, achievement of “the critical view of safety” during SILS cholecystectomy has not been evaluated. Objective: To evaluated the achievement of the critical view during SILS cholecystectomy. Surgical technique: Three 5mm traditional ports or SILS™ port was inserted through the 2cm of incision at the umbilicus by minilaparotomy. After the achievement of the pneumoperitoneum with CO2, the miniloop retractorTM was inserted at the right hypochondrium when the retraction of the gallbladder was required. Combined technique with crossover, cross hand and parallel approaches was used for the procedure using articulating devises. Patients and methods: Patients indicated for SILS cholecystectomy was enrolled in this study. We defined the critical view into two categories; Complete critical view (CCV): both the cystic duct and the artery were clearly dissected concomitantly, Stepwise critical view (SCV): the cystic duct was clearly dissected after the cystic artery was divided. 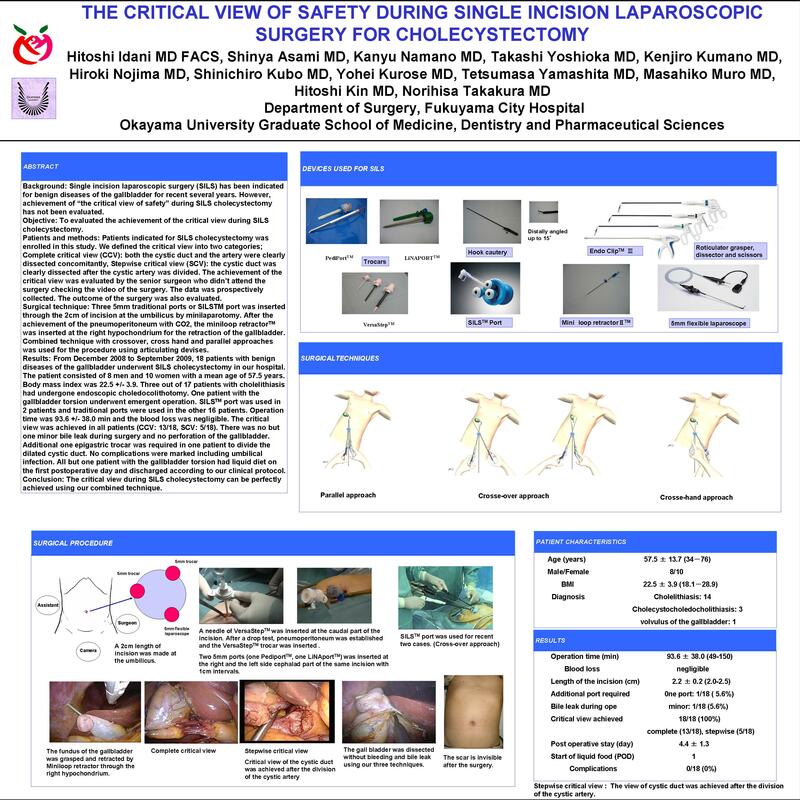 The achievement of the critical view was evaluated by the senior surgeon who didn’t attend the surgery checking the video of the surgery. The data was prospectively collected. The outcome of the surgery was also evaluated. Results: From December 2008 to September 2009, 18 patients with benign diseases of the gallbladder underwent SILS cholecystectomy in our hospital. The patient consisted of 8 men and 10 women with a mean age of 57.5 years. Body mass index was 22.5 +/- 3.9. Three out of 17 patients with cholelithiasis had undergone endoscopic choledocolithotomy. One patient with the gallbladder torsion underwent emergent operation. SILS™ port was used in 2 patients and traditional ports were used in the other 16 patients. Operation time was 93.6 +/- 38.0 min and the blood loss was negligible. The critical view was achieved in all patients (CCV: 13/18, SCV: 5/18). There was no but one minor bile leak during surgery and no perforation of the gallbladder. Additional one epigastric trocar was required in one patient to divide the dilated cystic duct. No perioperative complications were marked including umbilical infection. All patients had liquid diet on the first postoperative day and discharged according to our clinical protocol. Conclusion: The critical view during SILS cholecystectomy can be perfectly achieved using our combined technique.